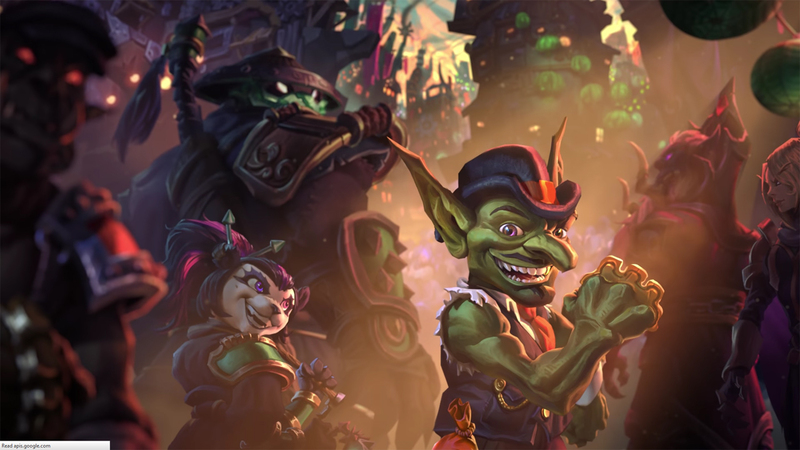 Fans of the engineering aptitudes of the short, snarky races of Azeroth have been treated with Hearthstone’s first expansion: Goblins vs Gnomes. 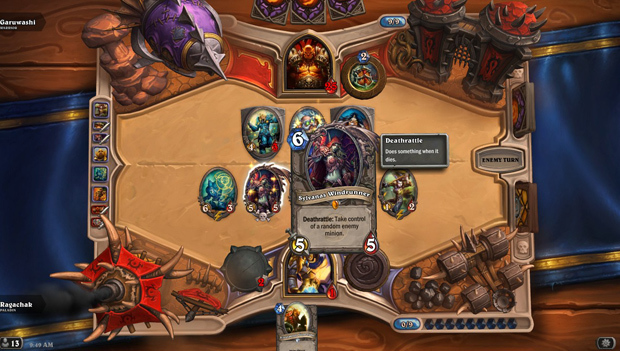 While it was thought that Curse of Naxxramas was the game’s first expansion, it was only a single-player “Adventure.” Naxxramas is still a paid feature that requires players to have all of the classes unlocked to access it, and I am still disappointed that the game lacks a form of multiplayer adventure (a la MTG’s Archenemy). 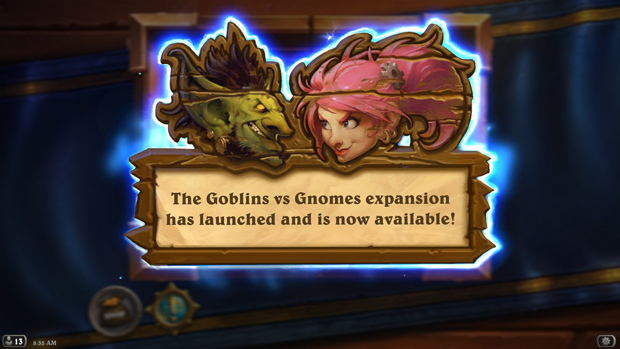 Meanwhile, Goblins vs Gnomes doesn’t add much to Hearthstone. Admittedly this is still a free game, so I would not expect an expansion on the level of Warlords of Draenor. 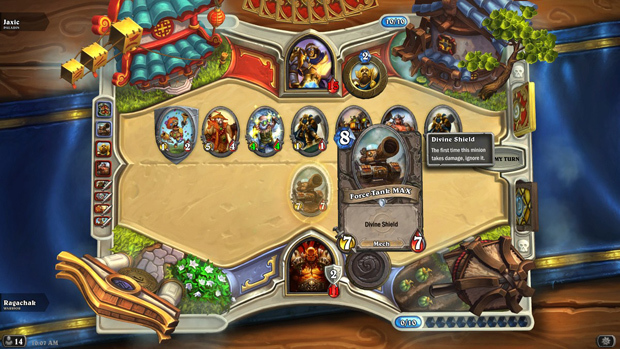 What you can count on, though, is more of the same solid gameplay that Hearthstone offered in the first place. Goblins vs. Gnomes came out in an interesting way at least, debuting as an Arena-Only event. People who participated got to try a free arena match with new fantastic cards! There are of course changes to current cards. Deck styles such as Hunter-Zoo (spam the field with lots and lots of Beast-type monsters to overrun an opponent with a great deal of speed) were nerfed or weakened. There are lots of new options with the new “Mech” style minions, plus many new legendaries and spells for all classes in the game! Plus Murlocs; everyone loves Murlocs. Let Me See Your Hand. . . While this expansion did not add many features, it did introduce Spectator Mode. This allows players to peek in on their friends’ games and see what’s going on in the match. This has obvious positive and negative qualities; sure, your friend can spectate and see what is going on in a match, and they can also back-seat duel, telling you what to do (or at least suggesting) to give you a bit of an edge. This is of course a two-sided issue, because you can expect that opponents will be doing much the same. In ranked play this could be a serious disadvantage to someone (or people) who now have a voice in their ear telling them what cards to play, limiting the chance of an error. This is a dreadful idea! At least they can’t see both sides’ cards. But the spectating is in real time, which is rare for online gaming. League of Legends for example has a three minute delay. You can, however, disable spectating if you don’t want people watching you play. 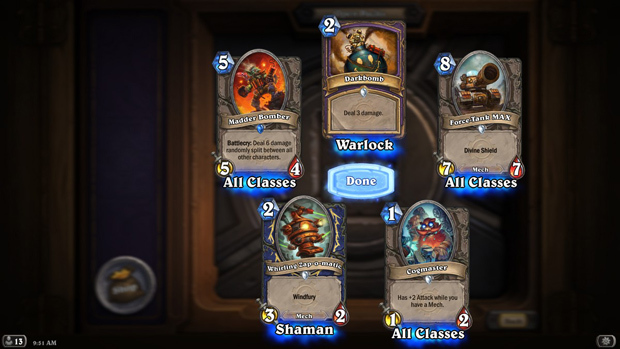 There are 143 new cards introduced to Hearthstone. It is important when you are buying packs to pick the right one! You won’t get new cards in the classic packs, and the new packs will only grant you the new expansion cards. The expansion patch also changed certain cards; for example, Soulfire, Gadgetzan Auctioneer, and Flare all gained +1 to their cost (Soulfire was a zero cost!). There were other changes such as some of the Druid minions becoming beasts (which will ultimately make them more powerful in a deck with synergy). With the mech cards come a new (uncollectable) card type called “Spare Parts.” Spare parts are one mana gem each and come as a result of certain mech-related cards. They give a variety of benefits such as “Freeze a minion,” “Give a minion Taunt,” or “Give a minion +1 Attack.” There are also amazing new Legendaries such as V-07-TR-0N from Ulduar. Combining three mechs plus Mimiron’s Head (Legendary) allows this uncollectible card to form, with its powerful Mega-Windfury, allowing it to attack four times in a row. I have made this rating cumulative, including the vanilla game as well as the expansion. While I love card games a great deal, this game feels more like Blizzard chose to (unnecessarily) dip into a money-hungry business model. Blizzard sits on top of the MMO world and did a great deal of work to get there – I am not arguing that. However, virtually everything in Hearthstone requires money. Sure you can “disenchant” cards to get new cards created, and sure, you can do quests to gain packs, but that takes quite a bit of time. People wanting to jump right in and acquire certain decks will wind up spending far more time and possibly money than they likely want to. At least with Magic the Gathering: Online, you can trade and purchase individual cards through other vendors. Blizzard wants complete control so we will not likely see trade/purchase of individual items for some time, no matter how good for the game it might be. Though I was disappointed that you can still not acquire singles outside of disenchant or Naxxramas (and of course the class cards you acquire while leveling), it’s still a fun expansion. There is enough new content to change the game without completely or permanently remodeling its gameplay. There are new decks and strategies that have come from it. I would recommend familiarizing yourself with the new cards and themes (Murlocks, Mechs, new beasts), and remember this is an online card game. Things can change at a moment’s notice. One thing I’d like to see changed are more Adventures (I suspect this is forthcoming anyway), and while I understand Naxxramas not being free, I don’t see the purpose of it having a cost, except perhaps that it has card rewards. All in all, there is good stuff to be had here, and it is not the purpose of this article to tell you all of the new amazing cards, but for you to become hyped, and go forth and find them! The cards are very pretty, and the boards where the game is played are reminiscent of the places in the Warcraft world which is certainly a boon. The addition of animated cards is also quite nice. Most of the cards feature lovely artwork as well. All in all it is a very pretty game, with familiar Warcraft art assets. This is a card game; I don’t expect complex controls, and that’s precisely what I get. Though there are occasional glitches with card selection that will forbid you from picking the card you want no matter how bad you might want to; other than that, the controls are nice and simple, and easy to understand. 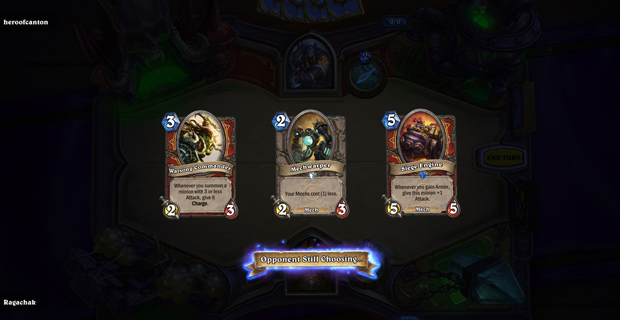 Yes, there are more features now, with Naxxramas, Arena, Ranked play and solo matches against the computer. Now there is also spectator mode, but that comes with the price of someone being able to help (as I stated above) which is more than unfair. And having to pay for the privilege of playing Naxxramas seems pretty ridiculous. Being able to use Quest gold is nice, and you at least get a little gold and possibly a pack in the Arena even if you lose all three matches. While I am a fan of Blizzard, this seems pretty lacking as far as features. I love all of the cool sounds and quotes from characters in the Warcraft franchise; the music can become quite repetitious and boring, despite how soothing and relaxing it starts off. I’d like to hear a greater array of music, perhaps some zone music from Warcraft, depending on what board you play on in Hearthstone.